"This is a very easy recipe and very popular. The recipe came from a neighbor who brought it to our annual 4th of July picnic." Preheat oven to 350 degrees F (175 degrees C). Spray one 9x13 inch pan with non-stick coating . Combine the cake mix, butter and 1/3 cup evaporated milk. Mix well and pour 2/3 of the batter into pan. Press pecans into batter and bake for 8 to 10 minutes. In a saucepan over medium heat, combine the caramel and 1/3 cup evaporated milk. Stir until melted and smooth; pour over cooled cake mix. Sprinkle chocolate chips on top of caramel and top with spoonfuls of remaining cake mix. Bake for additional l5 to l8 minutes; cool and cut. Superb brownies with a layer of popcorn, chocolate and other goodies! These were WAY too rich for me....though my son loved them. These are always wonderful. Devil's Food cake mix can be subbed in for the German chocolate and I usually add another cup of chocolate chips to make these extra rich and gooey. 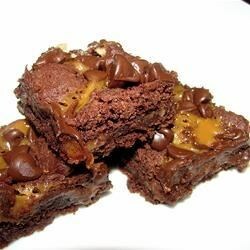 These brownies were gooey and perfect. I substituted milk duds for the caramel and chocolate chips and it made for less prep time and easy clean up.